I'm keeping an eye on our garden and just waiting for some of the larger veggies to ripen up (curse you, slow growing tomatoes!). 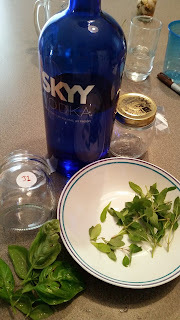 But in the mean time, I've thought of a way to put some of the already growing plants to use: flavor infused vodka! With our mint, as well as a number of other herbs ready for harvest and the Internet providing instructions, the process couldn't be simpler. Collect up plants. I had visions of making two different infusions: Mojito Mint and Borage, as well as Mojito Mint and Thai Sweet Basil. Alas, I didn't have enough mint to go around. So I settled for Mojito Mint with a few snippings of Borage and a Thai Sweet Basil. 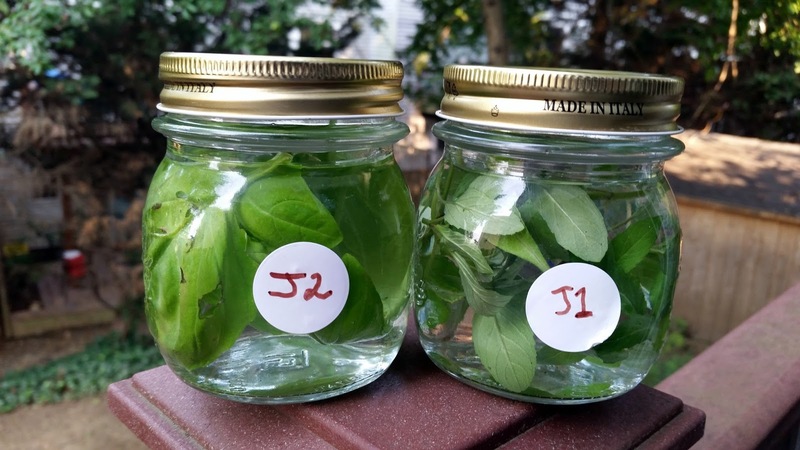 Filled jars part way with Vodka, dropped in the plants, filled the rest of the way. Did I use the Mojito Mint leaves too, early? Did I add enough Mojito Mint to flavor the vodka? Will basil flavored vodka be evenly remotely tasty? Will three leaves or so of borage make any difference in this concoction? Who knows. But I'll learn something when this is done. Incidentally, those white stickers labeled J1 and J2 aren't just stickers. They're NFC tags. I'm using the system I described here to track this little experiment. The way it's setup, I can hold my phone next to the jar, speak some notes and they are added here. So feel free to tag along and see how this little experiment goes.